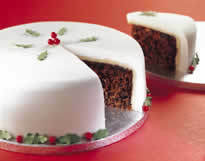 Looking for a foolproof and delectable eggless fruit cake recipe? Here’s an absolute beauty, published in my very first cookbook ‘Great Vegetarian Dishes’. It was originally given to me by Hari Bhakti Dasi who received it in true culinary disciplic succession from her dear mother. Try it – you won’t be disappointed. YIELD: one 20 cm (8-inch) round or square cake. Spoon the combined mixture into the prepared cake tin. Smooth out the mixture. Cover the tin with aluminium foil (or brown paper secured with string) and bake in a moderate oven 180C/355F for 1 1/2 – 2 hours. The cake can be uncovered for the last 1/2 hour of the cooking. To test whether the cake is done, insert a skewer through the centre of the cake. The cake is cooked if the skewer comes out clean. If the cake is done, remove it from the oven, allowing it to cool in the tin. (This will stop the cake from breaking).